As the results continue to dribble in, Italy has woken up to a bit of a mess. The 5 star is the biggest party at 30%, the right the largest coalition at. 35%, so nobody is going anywhere. Before the politicos start the dissection, its worth pointing out a few facts that are conveniently obfuscated before they reach us. Firstly, the 5 star is not a populist party. Nor are they anti establishment. Words bandied about by the media with more abandon than Sydney Pride. The 5 star party is merely anti corruption, but its a phrase the italian media find difficult to swallow and there fore have tweaked it to be acceptable. Secondly the election was not based on immigration. Salvini would have liked it to be. 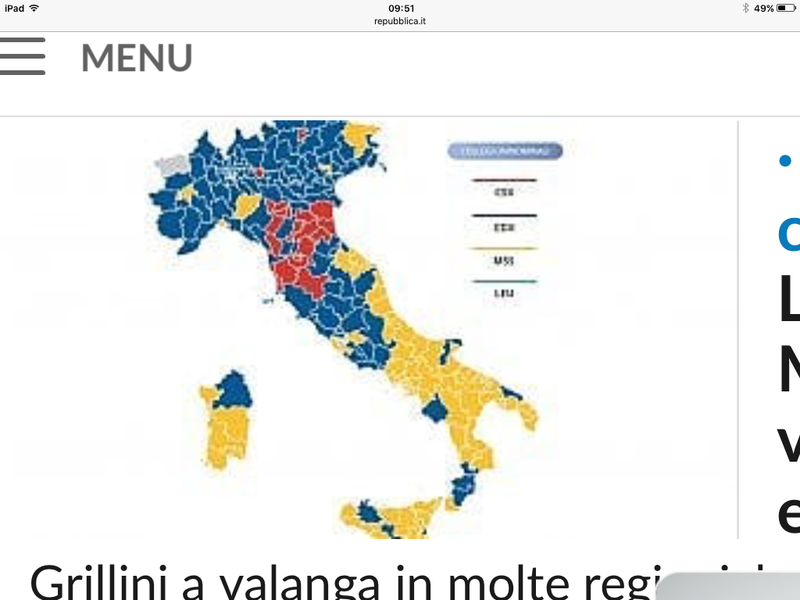 The media made sure it was, but apart from a couple of villages in the po valley, the election was about the snouts in the trough and the stasis of Italy. Nor is the Lega a populist party. It is a semi fascist party which may be popular or not but its a bit twee calling it populist, As Cicely so rightly said in the Importance of Being Earnest, When I see a spade, I call it a spade. The cause of all this erroneous labelling is twofold. The naturally conservative, better the devil you know, Italians cant really process a new political party that doesnt have at least one ex prime minister in it. Secondly the press and media want neither 5 star or the lega in power. Both have threatened the tv stations with political independence and less money. The 5 star have said they will end the trough fest of the papers in italy getting 200 million a year of public money to help them print lies. So the papers would certainly rather have the old style parties who they finance and in return finance them. Thirdly we have the chorus of ‘what happens now’. Well its not going to be the president who decides. We are in Italy and there are various people above the presidnet of the land when it comes to decidi g for our own good. There will be highly secret consultations with the Vatican, talks with important italaians and non who have money invested here, and certainly a quiet phone call with someone in Europe. Only then will the president opt for doing nothing and letting it all go on as before. The Vatican has a problem, the 5 star are not terribly catholic. but the Lega is very churchy- uncomfortably so, and the idea of the church being so blatantly anti christian in its outlook might harm the business. The 5 star would be committing suicide if they worked with the Lega, but facing oblivion if they do nothing. The one good thing to come out of all of this is the Berlusconi is a has been. Its taken 30 years, but the Italians have seen the light. So as of today the green white and red Italy is no more. The south of the peninsular athe islands are firmly yellow, (5star) and north of rome its blue (centre right) with the odd pocket of renzi centre left, replacing the die hard communism of the 20th century. given the distinct borderline we are now in a kingdom of the two Italies, a south ich has been persecuted and blamed, who want a corruption free level playing field, and the north running scared of ‘populists’ ‘immigrants’ and spending the money due to corruption while blaming it on the others. If ever there was an argument for a federal italian state, this is it. Posted on 05/03/2018 by rammers. This entry was posted in Uncategorized. Bookmark the permalink.